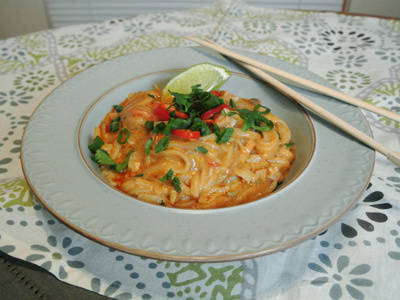 To make this dish you’ll need some red curry paste, coconut milk, peanut butter, fish sauce, soy sauce, shaoxing rice wine, turbinado sugar, chicken stock, and rice noodles. 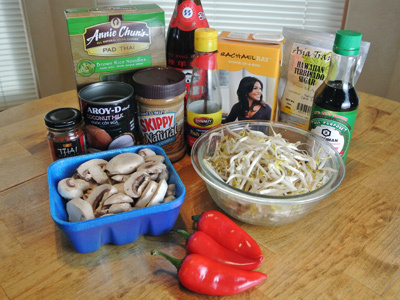 I added sliced mushrooms, bean sprouts and fresno red peppers to the mix as well as a couple of chicken thighs that were cut into small bite size pieces. If you want to go vegetarian, just skip the chicken. 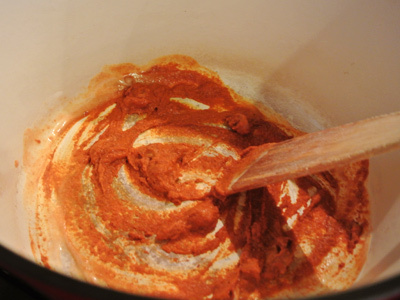 Depending on how spicy you want to go, add 3 – 4 tablespoons of the curry paste into a large pot or dutch oven. Stir the curry over medium high heat for a minute or so until it becomes fragrant. 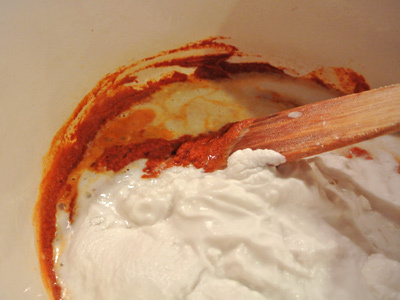 Add the coconut milk and give it a stir. Next comes the chicken stock. 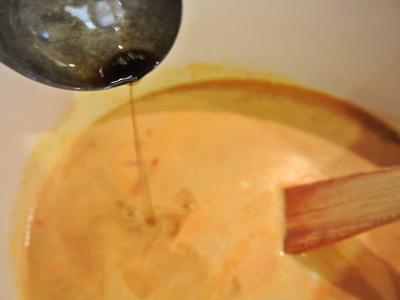 Add a tablespoon of fish sauce, a tablespoon of soy sauce, and 2 tablespoons shaoxing rice wine. And to sweeten it up a bit, a couple tablespoons of turbinado sugar. 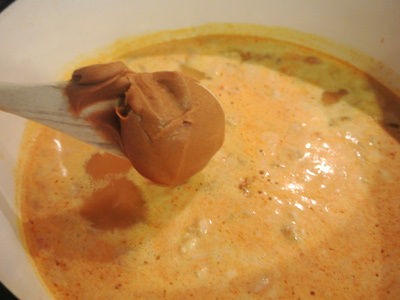 Stir the peanut butter into the simmering pot. Lastly, add the chicken, place the lid on top and let simmer for 15 minutes to cook the chicken through. 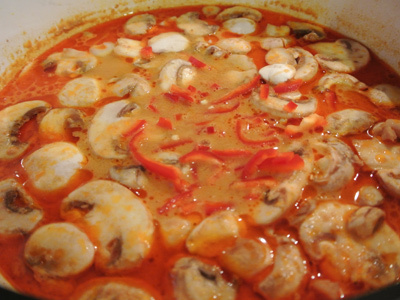 Once the chicken is fully cooked, add the sliced mushrooms and fresno red peppers. And the bean sprouts. Stir in the vegetables and set the lid on to simmer for about 5 minutes. 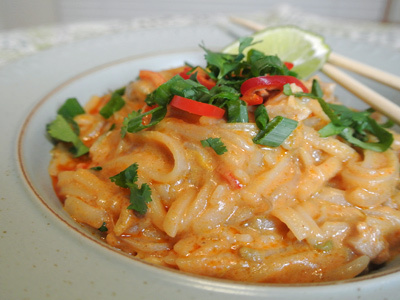 Add the rice noodles last. 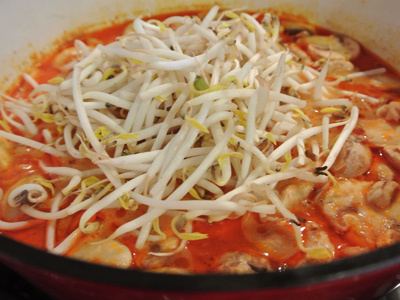 Keep in mind if you want to make this ahead of time you and would rather have a soupy broth rather than a thicker sauce just hold out the rice noodles until about 10 minutes before you serve. Reheat the soup and cook the noodles for 5 minutes. If I had served up a bowl immediately it would have looked more like this! 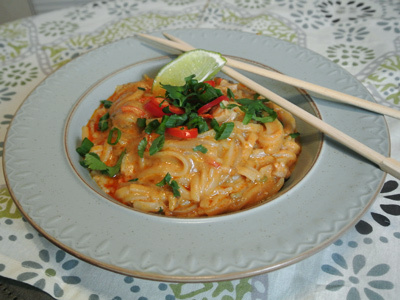 Some chopped green onion, cilantro and fresno red pepper and a wedge of lime top my noodles. A sprinkling of peanuts might be good too! Top with sliced fresno red pepper, sliced green onion, chopped cilantro and chopped roasted peanuts. Heat a large pot or dutch oven over medium high heat. 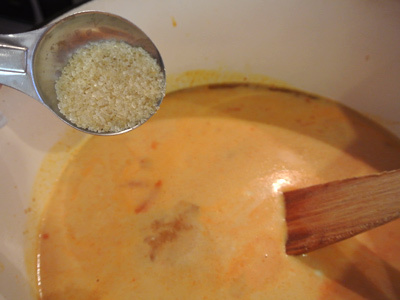 Add the curry paste and stir the pot until the curry becomes fragrant. 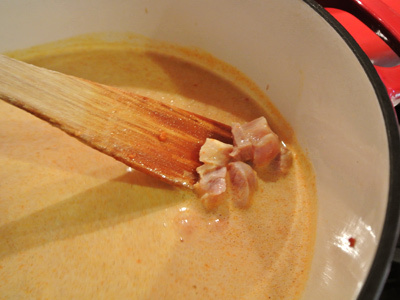 Stir in the can of coconut milk, chicken stock, fish sauce, soy sauce and shaoxing rice wine. Stir the pot and add the turbinado sugar, peanut butter and chicken. Bring the pot to a simmer and cover the pot with a lid and cook for 15 minutes or until the chicken has cooked through. 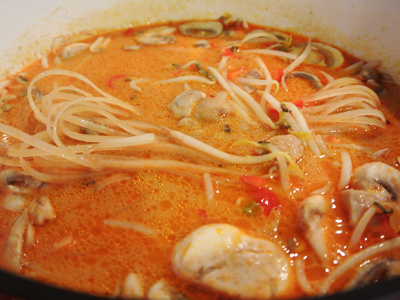 Add the mushrooms, fresno red pepper and bean sprouts and rice noodles and simmer an additional 5 minutes. Serve each bowl with a wedge of lime, chopped cilantro, sliced green onion, sliced fresno red pepper, and chopped roasted peanuts if desired. 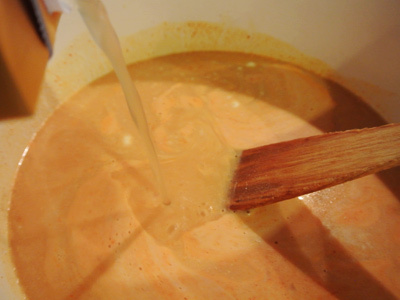 **Note the sauce will be thinner and more soup like when served immediately. 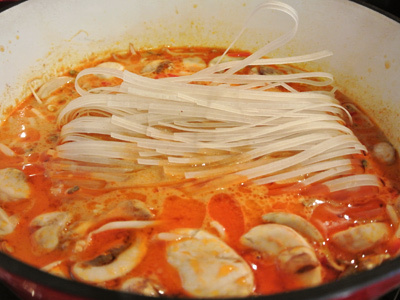 If left on the stove the noodles will absorb most of the liquid and the sauce will be much thicker to look more like a noodle bowl.